We have issued an errata for Bionic Strike Mecha Frieza in North American regions. The reasons for this decision are stated below. The errata will be issued in this region as well. We’d like to make a follow-up to our initial announcement on March 3rd about P-028 Frieza/Bionic Strike Mecha Frieza. It’s been about a month since the release of Cross Worlds, and we’ve received a tremendous amount of feedback about Bionic Strike Mecha Frieza via release tournaments and social media. We’d like to take this opportunity to thank everyone for contacting us and relaying their thoughts and opinions on the issue. We take this matter very seriously, and want to make sure that we do everything in our power to address it in a fair and reasonable way. As of this moment in April, 2018, the two most popular deck archetypes are the previously posted turn two kill deck and decks that use P-028 Frieza/Bionic Strike Mecha Frieza to search for specific cards using Extra Cards to build a powerful board position in the early game using little or no energy. Looking at things from our perspective as the team behind the game, both of these deck archetypes have failed to achieve overwhelming win ratios compared to other decks that don’t use Bionic Strike Mecha Frieza, so we don’t consider the current environment to be degenerate. Our reason for thinking this is that multiple decks and strategies exist for countering the two types of Bionic Strike Mecha Frieza-based decks mentioned above, and decks featuring a variety of different leader cards are still being played. There are also decks that we’ve confirmed to have 80% win rates against Bionic Strike Mecha Frieza decks. *Example decklists can be found below. That said, we felt that the existence of Bionic Strike Mecha Frieza might make it difficult to deliver our intended play experience in the future for a variety of reasons. Reason 1: Bionic Strike Mecha Frieza offers a generally useful ability that, going forward, may make future expansions less fun/interesting to explore. Reason 2: The existence of Bionic Strike Mecha Frieza will always demand our consideration when designing future cards, potentially limiting design space. Reason 3: There’s no easy solution to help starting players and those still learning the ropes to deal with the deck archetype. New players forced to play against the archetype may stop enjoying the game, lose interest, and quit. Reason 4: Competitive players will always have to keep the card in mind, limiting deck building freedom and affecting future enjoyment of the game. To resolve these issues, we’re going to be making changes to Frieza/Bionic Strike Mecha Frieza’s [Permanent] skill. [Permanent] When you activate an Extra Card, you may choose 1 card in your life and add it to your hand. If you do, reduce the energy cost of that Extra Card by 1 for the duration of the turn. If this reduces the energy cost of that Extra Card to less than 1, you may activate the card without paying the specified cost. [Permanent] During your opponent’s turn, when you activate an Extra Card, you may choose 1 card in your life and add it to your hand. If you do, reduce the energy cost of that Extra Card by 1 for the duration of the turn. If this reduces the energy cost of that Extra Card to less than 1, you may activate the card without paying the specified cost. If you use this skill to add a card in your life to your hand, negate this skill for the duration of the turn. [Permanent] When you activate an Extra Card, you may choose 1 card in your life and add it to your hand. If you do, reduce the energy cost of that Extra Card by 2 for the duration of the turn. If this reduces the energy cost of that Extra Card to less than 1, you may activate the card without paying the specified cost. [Permanent] During your opponent’s turn, when you activate an Extra Card, you may choose 1 card in your life and add it to your hand. If you do, reduce the energy cost of that Extra Card by 2 for the duration of the turn. If this reduces the energy cost of that Extra Card to less than 1, you may activate the card without paying the specified cost. Point 1: It allows you to activate multiple Extra Cards on your turn without spending energy, which in turn allows you to search for combo parts and play multiple Battle Cards on turn one. Point 2: With the right Extra Cards, you can add as many cards to your life as you want, resulting in degenerate early game (turn 1-2) activations of [Awaken] and plays involving [Super Combo]. We considered the possibility of banning Bionic Strike Mecha Frieza, but decided that limiting the causes behind these two issues would be enough to return the game to a more reasonable speed. Change 1: Tweak the [Permanent] skill on both sides of the card to limit use of the skill to your opponent’s turn only. This makes the degenerate early plays described in point 1 impossible. Change 2: Add a rider to the [Permanent] skill on the card’s front preventing you from using the skill more than once per turn, fixing the issue with early Awakenings and other degenerate plays. We’ve heard the opinion from many players and store owners that limiting the [Permanent] skill on both sides so that it can only be activated once per turn would solve the issue. However, players would still be able to activate the skill once on the front side, then flip the card over with Awakening and use the skill on the other aside, allowing for two activations in a single turn. We feared abusing this loophole might fuel degenerate combinations as more cards are added to the game, and decided that a more severe restriction was necessary. We want to apologize to any players who enjoy using Frieza/Bionic Strike Mecha Frieza. Whenever possible, we want to avoid issuing these kinds of changes to card text, but we felt it was imperative to the health of the game and community to issue the change. *There are no other cards that we currently consider worthy of being placed on notice at this time. We’re hard at work developing new card designs that will please diehard fans of the Dragon Ball series and card games alike. We can’t wait to show you what’s in store. 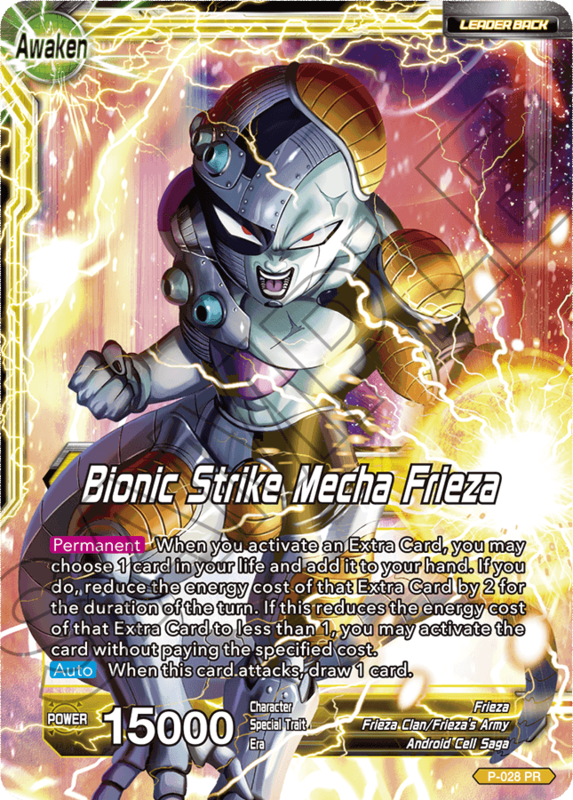 In our initial article addressing Bionic Strike Mecha Frieza, we introduced a pair of decks to counter the archetype: “Blue/Green Cell” and “Great Apes.” This time, we’d like to introduce a few decks that can deal with Bionic Strike decks that explode out of the gate with little to no energy. First, an explanation on how this type of Bionic Strike deck operates. By playing Extra Cards like BT3-105 Planet Vegeta on turn 1-2, the deck searches for the cards it needs to fuel an extremely long series of plays, Awakening early by continuously trading life for cards using Bionic Strike Mecha Frieza’s ability. From there, it uses the skills on cards like P-041 Saiyan Teamwork Cabba and BT3-100 Unwavering Solidarity Shugesh to build board position, then puts powerful cards like BT3-078 Unstoppable Ambition Super Saiyan Caulifla, BT2-095 Hidden Awakening Kale, and BT3-075 Terror Scythe Goku Black on the table to go for the kill. ① The energy costs and power of the Battle Cards it plays are low. ② It quickly drains itself down to 4 life or less. ② Its hand quickly fills up with unusable Extra Cards in the late game, and ends up with few cards to combo with. EX02-02 Masked Saiyan, the Mysterious Warrior is perfect for taking advantage of these weaknesses. Its skill can clear away low-cost Battle Cards and tokens, and can easily end games by attacking with [Double Strike] once your opponent is out of cards to combo with. Furthermore, it can also attack even if your opponent uses BT1-107 Cold Bloodlust. Your opponent has to give up a Cold Bloodlust and one of their Battle Cards during the attack, losing card advantage. They’re also at low life to begin with, making the life they have to spend to play Cold Bloodlust hurt that much more. Frieza/Bionic Strike Mecha Frieza makes it a potent counter to the archetype, even if you aren’t running any other hard counters. The deck list below is just one example. It may be possible to achieve even higher win rates with some tweaking. This is another strong counter to the archetype. Your opponent will be playing Battle Cards with 15000 power and below for the most part, so you can ride out the onslaught by using BT1-053 Senzu Bean and BT3-027 Unending Awakening to increase Pan’s power to 20000 and above. Pan can also draw 2-3 cards during you and your opponent’s first turns. The longer you can stall and prolong the game like this, the better. BT1-005 Furthering Destruction Champa gives your Leader [Double Strike], which can be deadly against low-life Mecha Frieza decks. In the mid-game, you can also use EX02-02 Masked Saiyan, the Mysterious Warrior’s [Over Realm], clearing away your opponent’s board. Against Bionic Strike Mecha Frieza decks that start fast but run out of gas just as quickly, this deck can win up to 80% of the time.